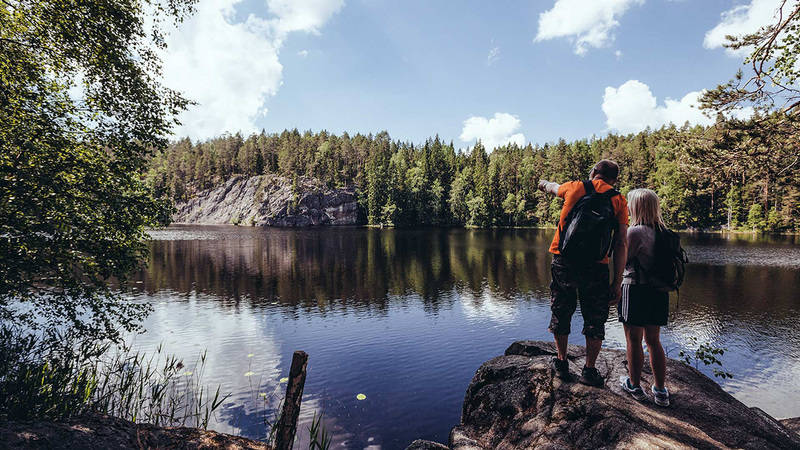 For tourists, and locals, in the Helsinki area, Nuuksio National Park provides an easily accessible escape from urban life into the wild where they can enjoy typical Finnish scenery, with lovely lakes, green forests, and rugged rocky crags. Situated just over 30 minutes from both Helsinki city centre and Helsinki-Vantaa Airport, Nuuksio National Park is perfect for memorable guided excursions in the forest, picking wild berries, herbs, and mushrooms, canoeing and fishing trips, a camping break, or a longer stay in one of the many lakeside log cabins, villas, or hotel. Nuuksio National Park – HikingThe landscape of Nuuksio National Park is dominated by valleys and gorges formed by the Ice Age, and is located on the border of the oak forest and southern boreal forest zones, with a mixture of coniferous and deciduous trees, and barren rocky hills covered in lichen. The park is home to a wide range of animals and birds, including the elusive Siberian flying squirrel, the symbol of Nuuksio. You can also find the Wood Lark and European Nightjar here, both of which are protected species. Scattered among the forested hills there are over 80 small lakes and ponds, some surrounded by open bogs and with brown water, others larger in size with crisp, clean water. The lakes are ideal for guided tours by canoe or kayak, and you can fish here too. Throughout the park there are many marked trails leading to many scenic high points with excellent views over the surrounding wilderness, where you can find your way with a professional wilderness guide. 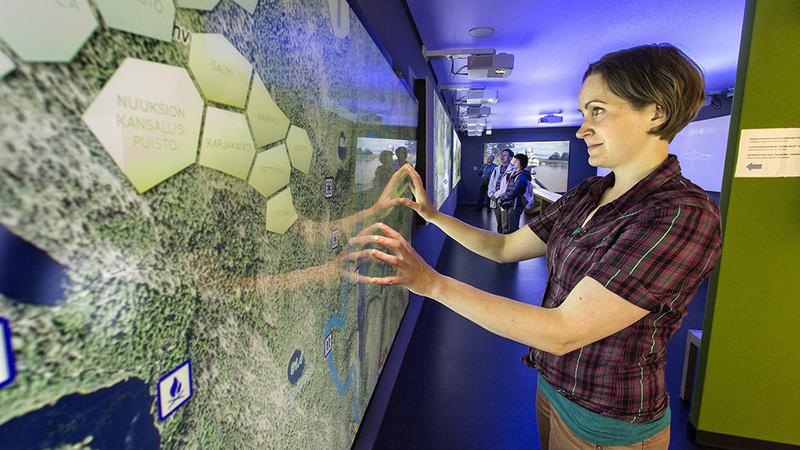 In addition to the modern Haltia Nature Centre visitors can also stop in to the Haukkalampi Nature Information Hut where they can learn about the diverse natural features of Nuuksio National Park. 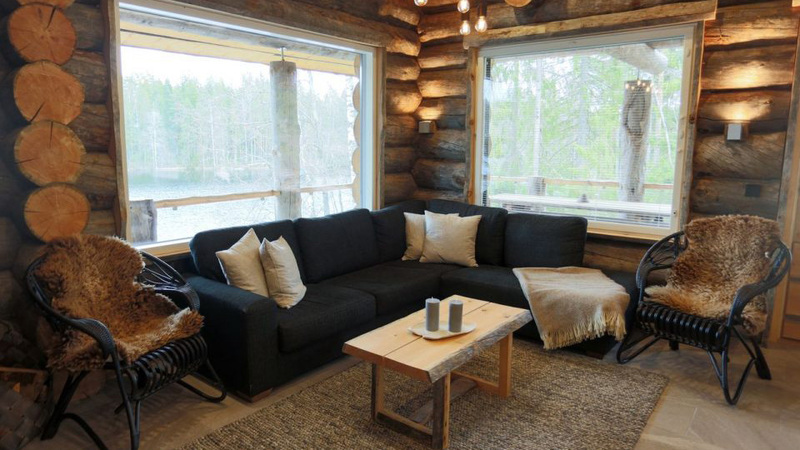 Having the distinction of being the only company to be based within the actual boundaries of the Nuuksio National Park, Aurora Nuuksio – Green Window provide a wide range of services. 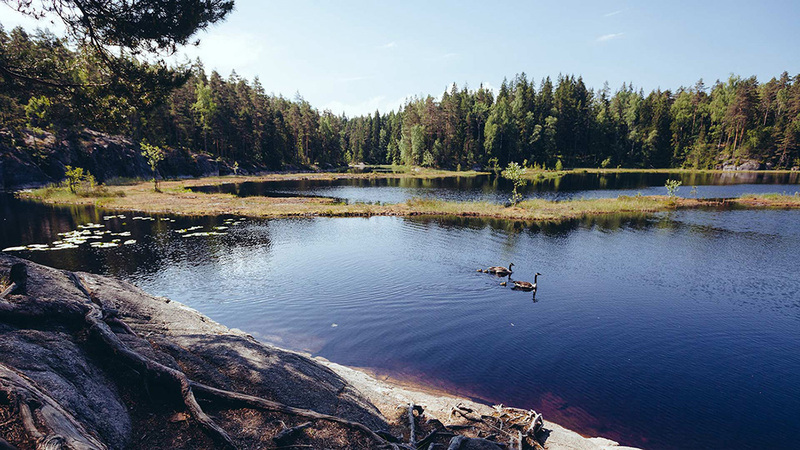 Located in the Kattila area, by Lake Kaitlampi, the picturesque valleys and hills surrounding Aurora Nuuksio provide excellent opportunities for outdoor activities and excursions. Green Window has over 30 years experience in guided excursions, with tailored packages for both for groups and individual travellers. Examples include forest treks themed around picking wild berries, herbs, and mushrooms, guided canoeing trips, and fishing trips with local experts. Aurora Nuuksio provides accommodation in the beautiful Aurora Nuuksio Forest Hotel, a 1930’s villa on a hilltop with views over the valley and lake below. 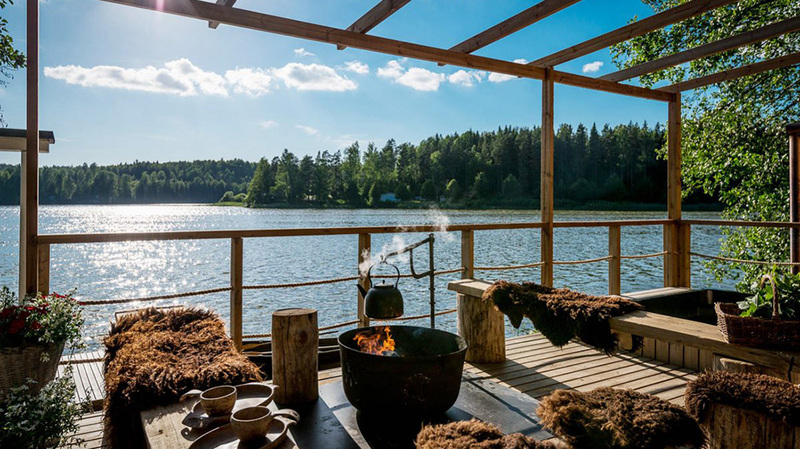 Guests can also stay in the rustic Valkalampi House, situated by the lake where there is also a traditional wood-heated sauna, and a pier perfect for taking a dip into the clean waters of the lake. 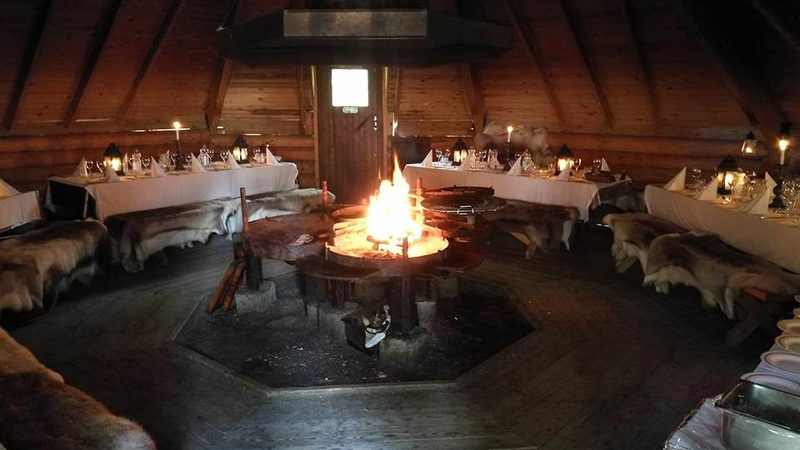 Guests can dine in either the award winning Forest Restaurant Aurora Nuuksio, or the traditional Kattila Lappish Hut, both of which can be reserved for groups. Aurora Nuuksio chefs specialise in traditional Finnish delicacies, and are experts in creating tasty and visually appealing meals from locally sourced ingredients. Nestled in the forest,less than 40km from Helsinki and the airport, Nuuksion Taika shares the magic of Nuuksio National Park with guests. Their “Magic of Finland” programs are among the best well-being programs selected by the official Finnish tourism agency, Visit Finland. Nuuksion Taika is specialised in Finnish folklore and mythology. During Magic of the Woods walking trip into the wilderness of the Nuuksio National Park, guests get in touch with nature in a unique way. They will hear stories from the Finland’s national epic, the Kalevala, and myths that surround the brown bear – the king of the woods. During summer they can pick berries and mushrooms, swim and fish in the lake and row a boat or paddle a canoe. In winter there are a range of activities that help guests enjoy the magic of Finnish winter, from ice-fishing to snowshoe and kick-sled excursions. 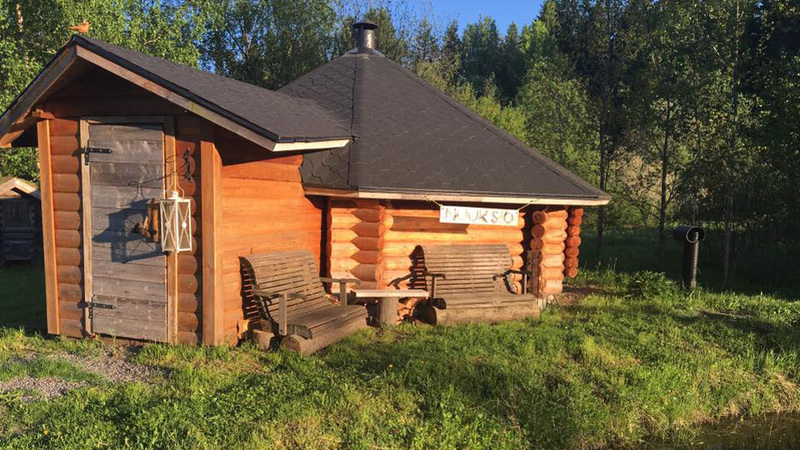 Magic of the Finnish Sauna experience helps guests to get in touch with the spirit of Finnish sauna and ancient sauna traditions. After relaxing moments in a wood heated sauna, they can refresh in a lake, and in winter can even enjoy an icy-swim. All the programs include moments by the campfire with delicious arctic food based on traditional Finnish recipes and prepared over an open fire. After an active day outdoors, guests can spend a Magic Night in this natural setting, either in the cottage or in the Magic Forest, an eco camp with our unique Tentsile Tree Tents, or a Laplander´s hut and Bear-cabin. Nuuksion Taika follows the principles of sustainable travel and arranges activities that are non-harmful to nature. Their activities are based on Finnish traditions and culture and are suitable for people of all ages and can be customized for people with special needs. 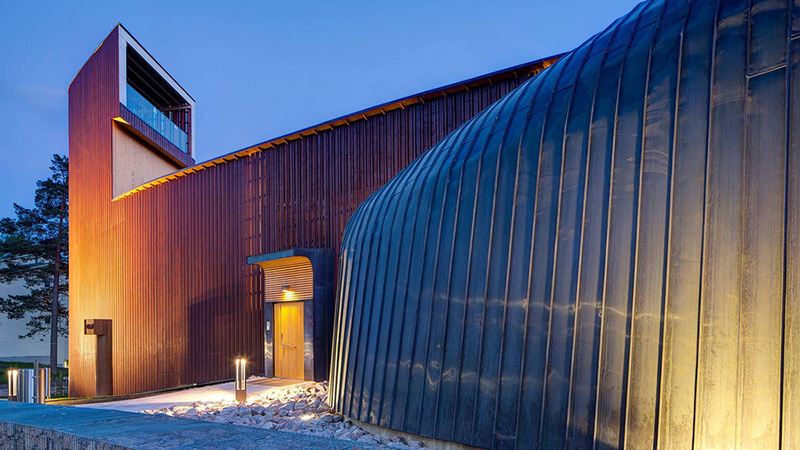 Haltia – the Finnish Nature Centre is a new type of visitor centre which brings all of Finland’s nature under one roof, with a range of visitor friendly facilities and exhibitions. All 40 of Finland’s national parks are represented, allowing visitors to experience the full range and scope of nature in the Helsinki region. The Snowy Canyon leads you to the main exhibition hall, where you can examine the Finnish winter and how animals and plants survive it. There are over 80 Finnish nature destinations that can be explored through touchscreens, from the Finnish Archipelago to the fells of Lapland. 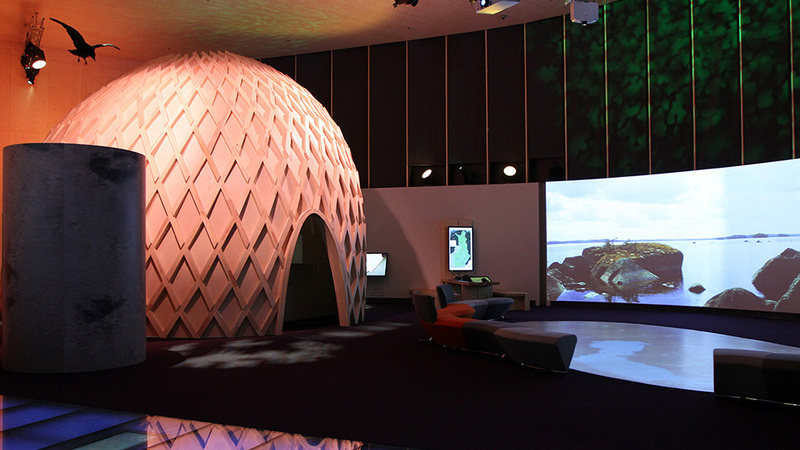 The exhibition includes a large wooden Duck Egg, which serves as the setting for the Game Theory video installation by artist Osmo Rauhala. There is also an introduction to the numerous nature experiences available in the Helsinki region, some of which will be well known while others much less so. Visitors to the Haltia Nature Centre are rewarded with wonderful views of the Nuuksio National Park, particularly from the spacious dining hall which looks over Lake Pitkäjärvi. Right from the front door there is access to the excellent hiking trails that abound, making it ideal as a starting or ending point for a hike in the park. 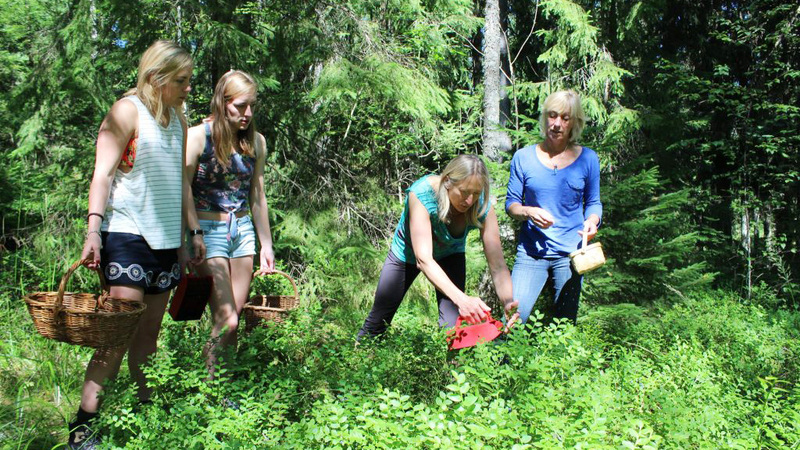 Feel The Nature provides professionally guided day excursions among the forests and lakes of wild Nuuksio National Park. 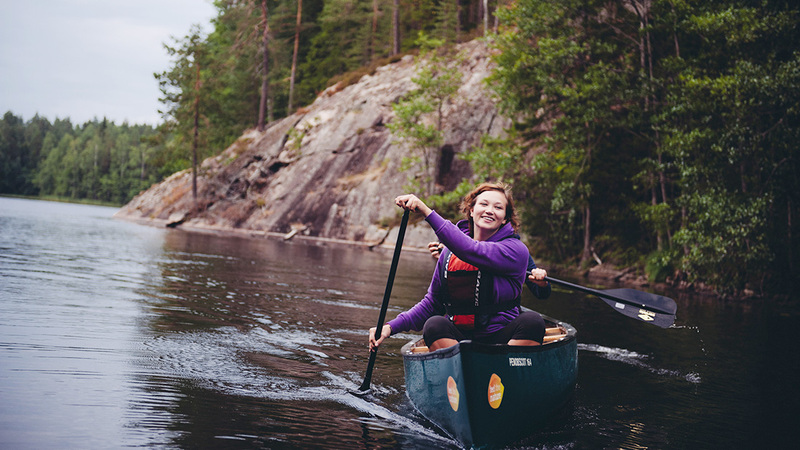 They organise open scheduled trips as well as private tours to the most fascinating places of Nuuksio, ranging from canoeing adventures, hiking trip, guided berry and mushroom excursions, or snowshoe hikes in winter. Feel The Nature will be delighted to give you an introduction to the unique Finnish Nature. Getting there couldn’t be easier, as Feel The Nature also provides pickups from central Helsinki and Helsinki-Vantaa Airport in their Naturevan minibus. 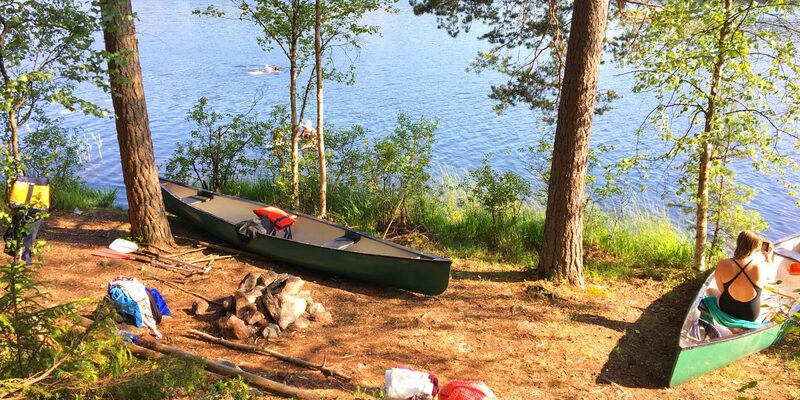 The relaxed Wilderness Canoeing Adventures take you to the lovely lakes and green peaceful forests in Nuuksio. The excursion includes a coffee and snack break by the lake, and an opportunity to dip into the clean water forest lake. 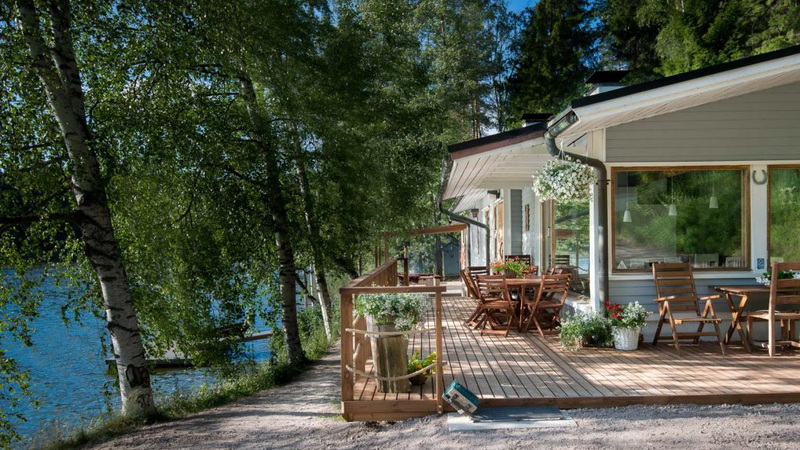 Feel The Nature also offers a Finnish Lakeside Cottage Retreat for private individuals or groups, for one or two nights, with a selection of five different villas and log cabins to choose from. For those who prefer to rough it, Feel The Nature offers an overnight program where guests can sleep in a tent, or under the stars. Their Day & Night in the Wilderness package gives you the chance to paddle in an Indian canoe, hike the old forests, and swim in the pure waters of the lakes. 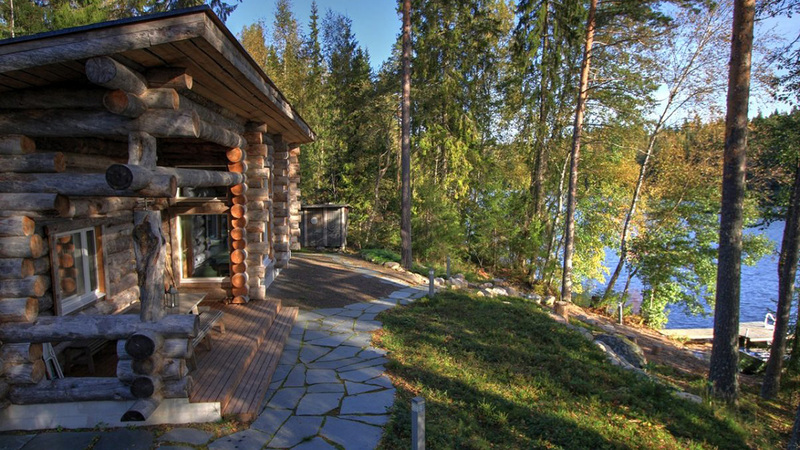 Stay at a modern luxury villa or at a traditional Finnish cottage by a peaceful forest lake. Hawkhill is a 3rd generation family business that began in 1961, providing a wide range of services and accommodation, surrounded by the vast wilderness of Nuuksio National Park about 45 minutes drive from central Helsinki. Hawkhill offers accommodation in a choice of luxurious villas, traditional log cabins, and a traditional wooden house, all located in a secluded woodland setting with its own sauna; and all apart from the house with its own waterfront and jetty, rowing boat, and a campfire perfect for grilling and barbeques. The interiors are decorated with modern scandinavian style using Finnish design brands such as Iittala, Hackman, Pentik and Marimekko. All saunas of Villas have been designed using Finnish handcraft at its best to guarantee the best possible sauna experience. 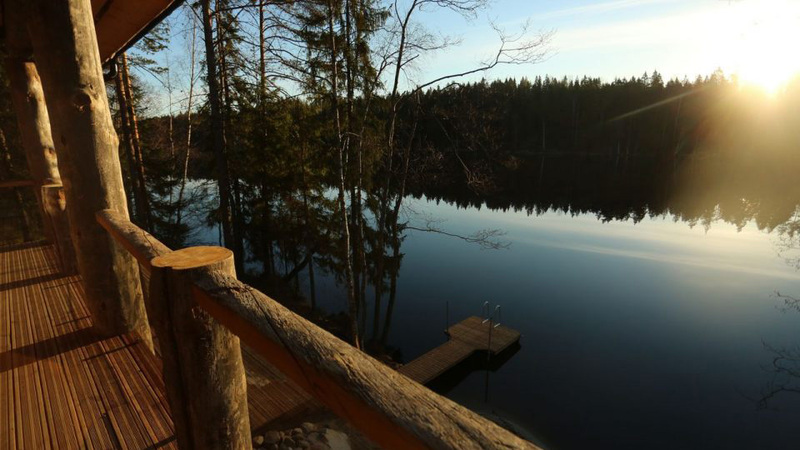 All of the properties are within easy walking distance of the amazing nature of Nuuksio National Park. Hawkhill provide a range of experiences that allows guests to experience the beauty of Finnish nature at its best, including hiking, snowshoe excursions, ice-fishing, and canoeing. In developing the sustainable nature of their business, Hawkhill participates in both the Green Start and GreenLeaders nature certification programs. 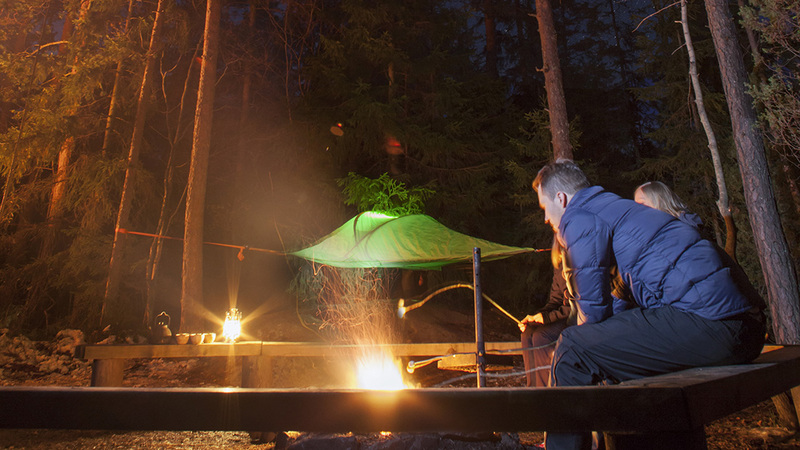 Honkalintu specialises in providing a range of nature activities within Nuuksio National Park, with packages that are ideal for small or large groups, and has three mobile, traditional Lappish kota tents that provide space for up to 300 people. 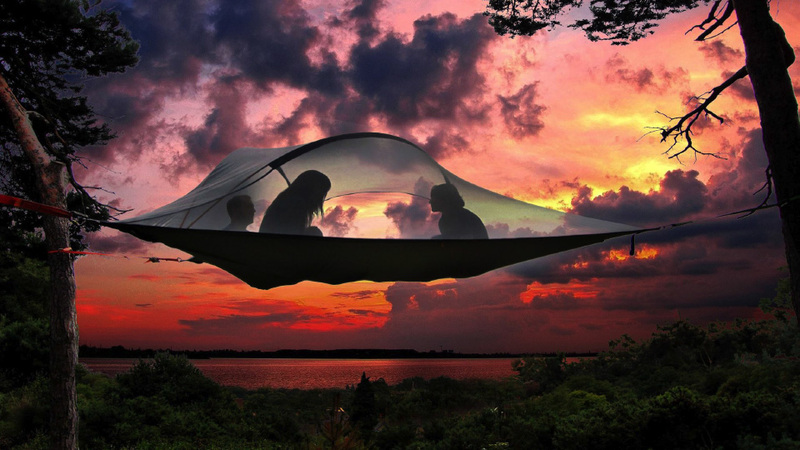 Honkalintu’s Tentsile Tree Tents are truly unique and a very ecological way to experience nature. 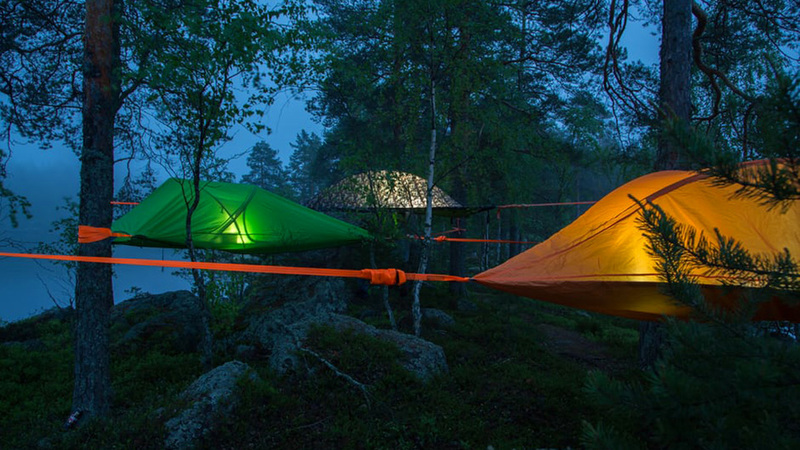 Tentsile Experience ”Night in the tree” provides guests with an incredible new way to experience a night in the forest. Suspended above the ground and swinging from the trees, these tents allow guests to camp in places where no one has camped before. Honkalintu’s EcoCamp area in Nuuksio National Park, near the Haltia Nature Centre, will be the most ecological, carbon-footprint friendly site in the world. Honkalintu will open a new Eco Camp to Vallisaari island next to the Suomenlinna fortress in summer 2018. In addition to the hiking trips, canoeing excursions, and outdoor games organised by Honkalintu, they also organise wilderness meals and wilderness cookery courses. 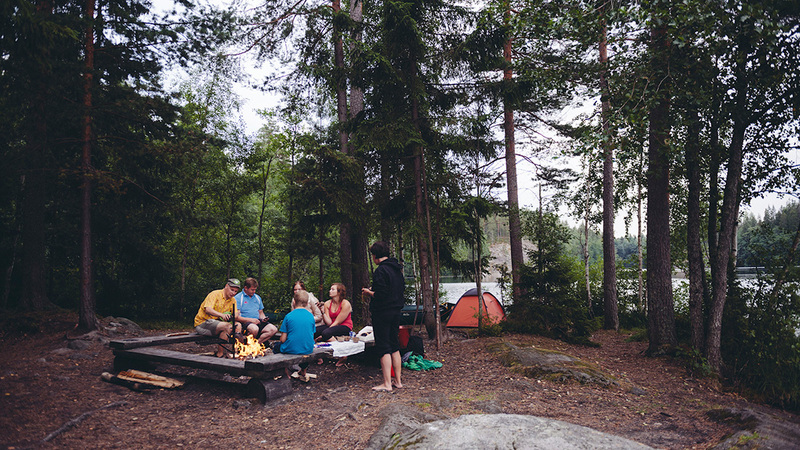 Kaikuva Activities – Nuuksio Hostel & Camping was founded in 1993, and is the oldest company operating in the Nuuksio region. 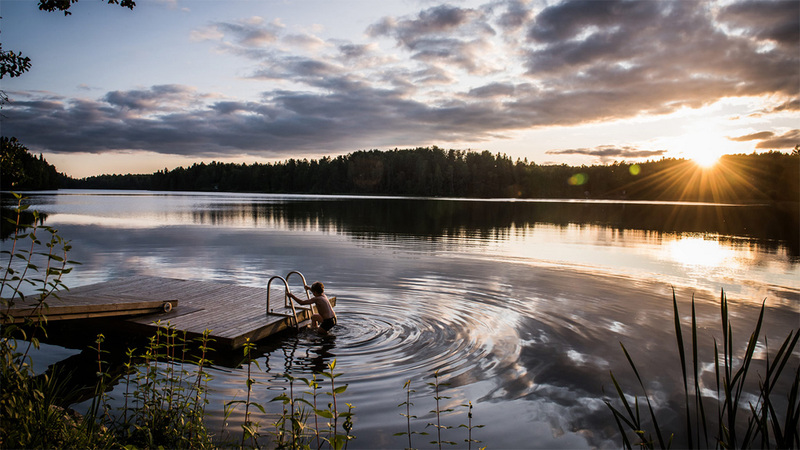 In addition to Kaikuva’s accommodation options, it also provides a range of nature activities in the forests and on the lakes of Nuuksio National Park. 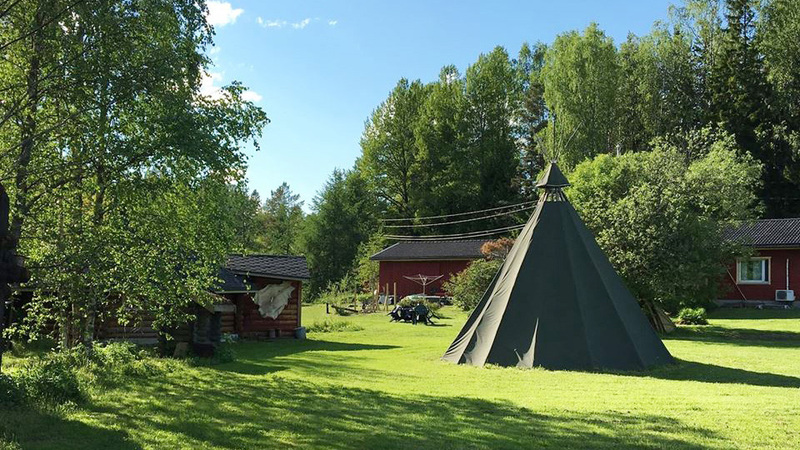 At Nuuksio Hostel & Camping there are a number of different sized tents for guests to choose from, which come with sleeping bags, pillows, camping mattresses, and in some cases with camping beds and mosquito nets. In the cosy hostel there are double and single rooms available, there is a toilet and shower inside, and guests are free to use the comfy living room and wi-fi. 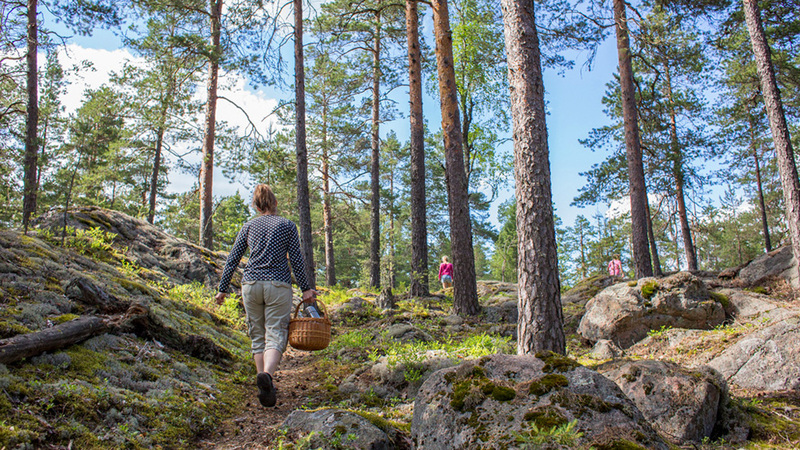 Kaikuva Activities provide guided hiking excursions, with expert survival tips and orienteering techniques, as well as explanations on the diversity of the park’s nature and wildlife. Hiking excursions can also include seasonal berry or mushroom picking, wildlife photo-tours, and even wilderness cooking. 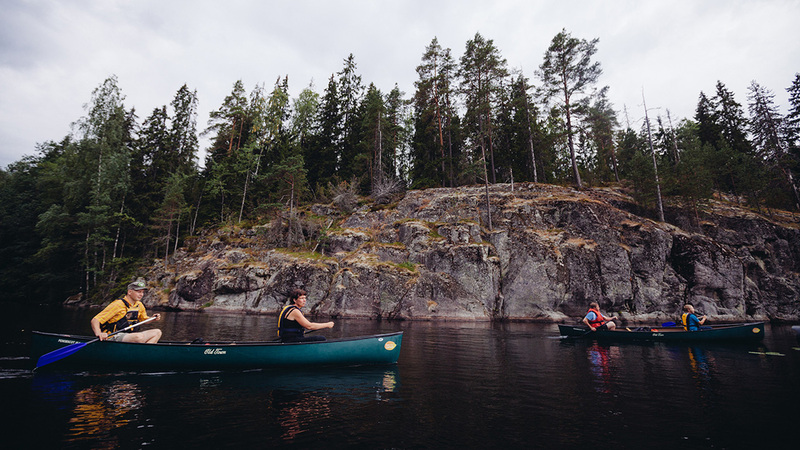 Kaikuva also organise guided canoe trips, with guests driven to the best spots where they can begin their paddling excursions. There is also the opportunity to spend some time fishing, either with a simple rod and line or on a fly-fishing trip to nearby Karkkila to try for trout. Fishing trips can be combined with canoeing trips. 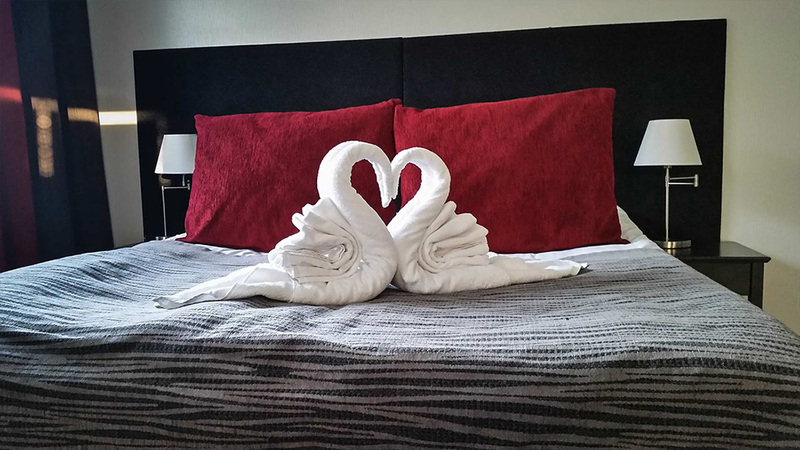 Situated by Lake Siikajärvi at the southern edge of Nuuksio National Park, recently renovated and refurbished Hotel Nuuksio provides accommodation to suit every need. It is situated at the gateway to one of Finland’s most beautiful national parks featuring rugged trails through natural forests, by sparkling lakes, and full of wildlife. 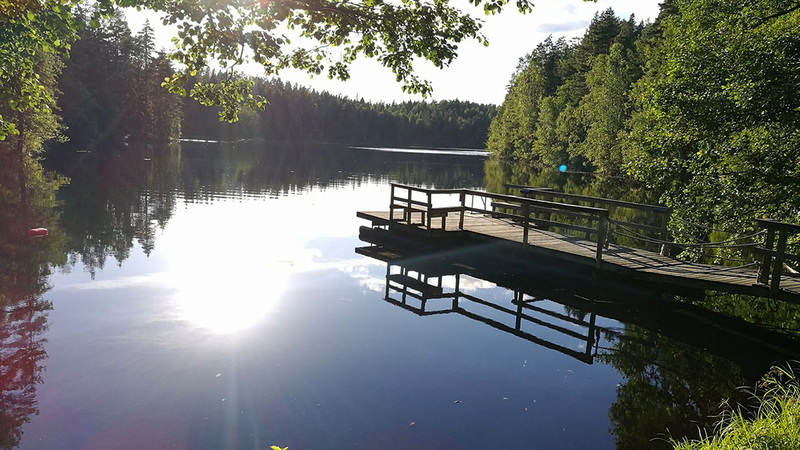 Hotel Nuuksio is ideally located for those seeking an escape from the hustle and bustle of everyday life, in search of serenity in the midst of a truly wild environment. 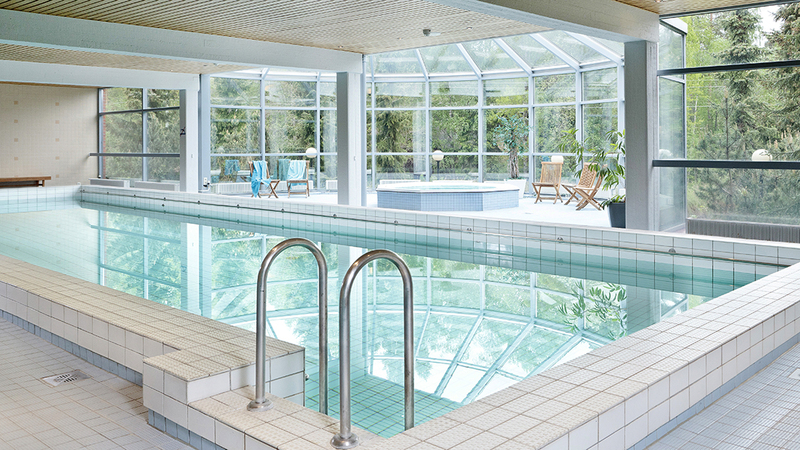 Hotel Nuuksio has a dedicated Spa area with a swimming pool and a jacuzzi, and can provide a range of beauty treatments and therapies that includes massage and acupuncture by prior arrangement. 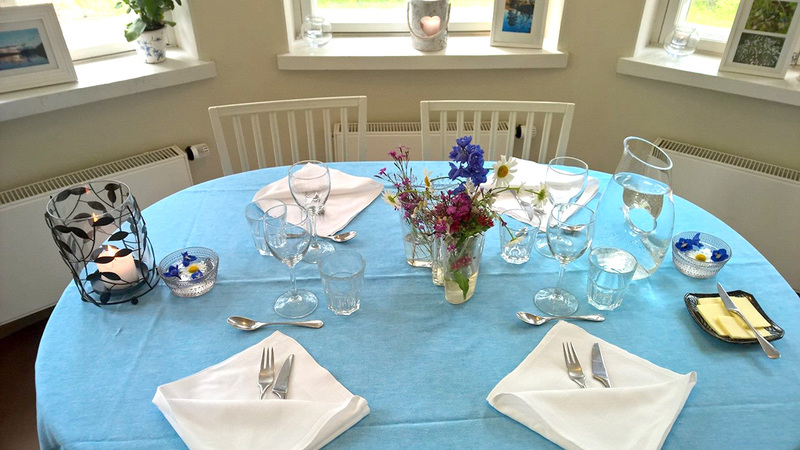 There is a fully equipped gym, a tennis court, and boats that can be rented, as well as two beach saunas on the shore of Lake Siikajärvi. Within the grounds there is also a traditional log villa which can sleep up to 10 people, and a kota hut with an open fire grill and a laavu with open fire wicket available to rent. One of the most unique offerings in Hotel Nuuksio is the opportunity for guests to spend a night in a hammock outdoors. The Hotel Nuuksio chefs take their inspiration from nature, delivering high quality food sourced locally wherever possible, fresh and in season. The Nuuksio Tupa restaurant is situated next to the comfortable lobby bar by the reception, and during the summer months can be extended onto the terrace, with delightful views over the lake.